On this date in 1570, the English Catholic martyr John Felton suffered hanging, disemboweling, and quartering at St. Paul’s Churchyard in London for the Old Faith. Not to be confused with the 17th century assassin of the same name, our John Felton was reported by the biography from his daughter’s hand to be a wealthy Southwark gentleman whose wife had gamboled in her own childhood with the future Queen Elizabeth. John’s crime was to hang up publicly in the dark of night before Corpus Christi the papal bull excommunicating Queen Elizabeth — an act not merely of religious dissidence but of overt political rebellion, inasmuch as the bull released English subjects from their obedience to “the pretended Queen of England” and exhorted them on pain of damnation to ignore her edicts. This directive from Rome was to prove so taxing for Catholics that it was soon modified to permit outward obedience in civil matters, pending the overthrow of the heresiarchess. Following a decade of uneasy religious tolerance — in which, not coincidentally, Elizabeth entertained the suits of assorted continental royalty, some of them Catholic — Regnans in Excelsis marked the onset of open hostilities. The Catholic “Ridolfi plot” would be hatched this very year, for instance, and lead the Duke of Norfolk to the scaffold by 1572. And then he said, O Lord, into thy hands I commend my spirit, in English; and as he was saying it in Latin, In munus tuas Domine, he was turned off the ladder; and hanging there six turns, he was cut down, and carried to the block, and there his head was smitten off, and held up, that the people might see it: whereat the people gave a shout, wishing that all Traitors were so served. Then he was quartered, and carried to Newgate to be parboiled, and so set up as the other rebels were. — God save the Queen. John Felton’s son Thomas Felton was also martyred, in 1588. Both have since been beatified. The rack, or question, to extort a confession from criminals, is a practice of a different nature: this being only used to compel a man to put himself upon his trial; that being a species of trial in itself. And the trial by rack is utterly unknown to the law of England; though once when the dukes of Exeter and Suffolk, and other ministers of Henry VI, had laid a design to introduce the civil law into this kingdom as the rule of government, for a beginning thereof they erected a rack for torture; which was called in derision the duke of Exeter’s daughter, and still remains in the tower of London: where it was occasionally used as an engine of state, not of law, more than once in the reign of queen Elizabeth but when, upon the assassination of Villiers duke of Buckingham by Felton, it was proposed in the privy council to put the assassin to the rack, in order to discover his accomplices; the judges, being consulted, declared unanimously, to their own honour and the honour of the English law, that no such proceeding was allowable by the laws of England. Although the jurisprudence of 17th century England with its proscription of legal torture* still stacks up favorably next to that of Berkeley law professors, it certainly did not stand in the way of assassin John Felton‘s execution on this date in 1628. Your shakl’d consciences from one man’s thrall? But O! his countrie! what can you verdict on? If guiltie; ’tis of your redemption. 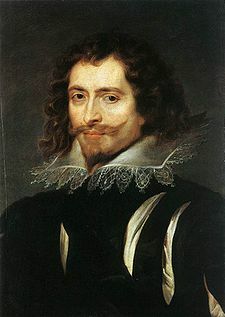 Felton’s victim, the Duke of Buckingham — portrayed in 1625 by Rubens. Buckingham latched himself to the king’s 20-something son and heir Charles I and became a dominant influence in foreign policy as well as wildly unpopular in England. He raised Protestant hackles with Machiavellian statecraft like angling for a Spanish queen and aiding the French against the Huguenots, and since he exercised a share of the royal power he vigorously upheld the rights of the crown as against those of the commons. An opponent once compared him to Sejanus. Indeed, Buckingham helped the youthful Charles, king since March of 1625, set the tetchy tone for his relationship with Parliament that would define his rule and ultimately cost the monarch his own head. When Parliament demanded Buckingham “be removed from intermeddling with the great affairs of State” as a condition for coughing up any more money, Charles haughtily dissolved Parliament rather than give up his favorite. That forced the king into sketchy expedients like the “forced loan” and, when the money disputes continued after Buckingham’s death, the king’s eventual legislature-free Personal Rule that set up the Civil War. [t]he passage of Felton to London, after the assassination, seemed a triumph. Now pitied, and now blessed, mothers held up their children to behold the saviour of the country; and an old woman exclaimed, as Felton passed her, with a scriptural allusion to his short stature, and the mightiness of Buckingham, “God bless thee, little David!” Felton was nearly sainted before he reached the metropolis. His health was the reigning toast among the republicans. While he’s sometimes described — or dismissed — as merely a disgruntled careerist, the assassin’s own ideological commitment ought not be downplayed. Whatever Felton’s personal pique, the assassination was unambiguously political: our killer had returned from war wounded and melancholy and proceeded to marinate in the era’s anti-monarchical currents. In time, Felton came to understand — surely in concert with many of his countrymen now forgotten by time — that there was a greater good to be served by the sin of murder. He had left behind in his trunk a few propositions that underscored his state of mind: “There is no alliance nearer to any one than his country” and “No law is more sacred than the safety and welfare of the commonwealth.” He justified himself at trial in similar terms, and did so without desiring to escape the extremities of the law that his crime demanded. While Felton played his part in the generations-long struggle to subordinate king to parliament, the most immediate beneficiary of this affair was not so much the Commons as it was the noble rival who usurped the late Buckingham’s power — the Earl of Strafford. That’s the way to convince judges not to torture you. ** An entirely less negative remembrance commemorates Buckingham and “accursed” Felton at the Portsmouth Cathedral. 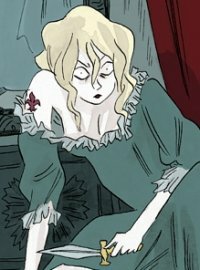 † Felton also appears in The Three Musketeers, committing the murder of Buckingham at the instigation of the seductive fictional villain Milady de Winter just days before the musketeers execute Milady herself.